The South West Sydney region had for many years been the forgotten part of Sydney. People talk about Western Sydney when they essentially mean Parramatta, Blacktown and Penrith. It may only be a geographical glitch, but the end result is that the places that make up the south west, Campbelltown, Liverpool, Camden and Wollondilly, have tended to miss out. And it’s not just their fair share of infrastructure that they’ve had to do without over the past few decades. These local residents have also missed out when it comes to having professional sporting teams representing them. We’re talking here about the very top tier, NRL, AFL and A-League in terms of the football codes, but this could also apply to netball and basketball, to mention just a few. Yes, we’ve had some crumbs thrown our way over the past 30 years or so, with Western Suburbs Magpies relocating to Campbelltown in 1987. Wests Tigers currently play three home games at Campbelltown Sports Stadium, pictured above. In the late 1990s the Razorbacks NBL club played out of Liverpool, but that’s pretty much it. Any place worth its salt must have a professional sporting team – this is Australia after all, where most of our heroes are footy or cricket players, from Tim Cahill to Jonathan Thurston to Buddy Franklin – all the way back to the Don. Monday night’s announcement that the two local bids for an A-League licence had joined forces was exciting because it has made the local case more compelling than ever before. A merger is not an easy thing to achieve in any walk of life and this one would not have been an exception. Credit must go to Campbelltown mayor George Brticevic and South West Sydney FC chairman Gino Marra for showing true vision in coming together for the benefit of all of our local residents. 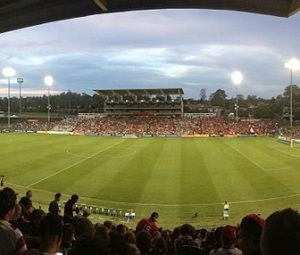 There’s no doubt George Brticevic has been the driving force of the campaign to have an A-League team playing out of Campbelltown Stadium. A self-confessed football-mad fan, the mayor should be commended for putting the interests of the bid ahead of everything else. The logo of South West Sydney FC, which has now joined forces with United for Macarthur. Along with Gino Marra and all of the people involved in the bid between now and October 31 – D-Day – they will give it all they’ve got to succeed. Now all we need is for the FFA to see the light and that is South West Sydney deserves an A-League team. Let’s remind the FFA once again that an estimated two million people will call our region home by 2035. There are currently more than 24,000 registered football players – male and female – in this great area. And there are more than 70 clubs with 3,600 players participating in NPL football – the tier just below the A-League. Having a great stadium located a couple of minutes from a railway station as part of the bid is just the icing on the cake. South West Sydney FC and United for Macarthur were announced on June 29 as two of the 10 successful bids – out of 15 submitted – to progress into the final phase of A-League expansion starting in 2019. Well now there are nine bids shooting for two licences and the united Macarthur and South West Sydney bid has surely got to be among the favourites.